The ukiyo painting called nikuhitsu-ga ("handpainted pictures"), predates ukiyo-e woodblock prints and is artistically more prestigious. The masters of woodblock prints were also capable painters. 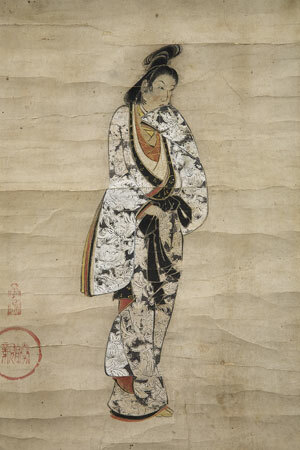 The upper part of the kakemono features a short calligraphic poem, in a classical Chinese form, praising the charms of the beauty depicted and signed "Hen-un rōjin". Perfume emanates from the kingfisher-blue sleeves of supple silk. Her waist so slim and skin so tender – how fresh she looks! That she would break the heart even of a man of iron. The lower of the three red seals can be identified as Shōshin (Katsushika) and refers to a painter called Hasegawa, Shōshin about whom nothing more is known. He probably belonged to the painter family Hasegawa. The pure Chinese poem without supplementary syllabic characters conforms to the rules of the Chinese art of poetry.